When a Match is not a Match? Got BIG Y test results? Now what? Your genome had already been on a long journey before your parents got together to conceive the unique you. If the current estimates of our best scientists are to be believed, the human portion of that journey could have taken more than 300,000 years. For our genomes to have survived the extreme climate changes, wars, famines and disease is a miracle equal to those of the ones surrounding the creation of our species and our universe. Most of our genealogies focus on identifying and chronicling the lives of those who were the carriers of our genomes during the last few hundred years of this incredible journey. That is likely only one tenth of one percent of the journey of our species down to who we are today. Documenting even this tiny part of the journey of our genomes can be a very formidable challenge. Rule #1. Start what your know (yourself) and build back to what you don't know --- step-by-step. Don't skip steps!! That's still a great rule that 21st century genealogists violate only at great peril. 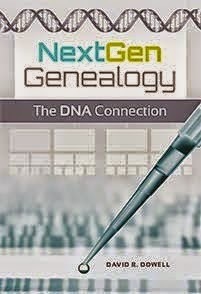 However, now the more intrepid of us can turn this rule on its head and attempt what in my just released NextGen Genealogy: The DNA Connection I call reverse genealogy. Basically this involves starting at the beginning with mtEve or yAdam and tracing our SNP flows down toward the present. We are able to do this because of two kinds of "celibate DNA" or DNA that is not recombined between the contribution of the mother and the contribution of the father when an embryo is conceived. As a result this DNA is passed relatively intact from generation to generation to generation. We have been able to trace our "umbilical lines" of descent for the last few years if we have tested all 16,569 locations along our mtDNA. Since all of us inherited mtDNA from our mothers, all of us can trace our "umbilical line" down to the present. Conceptually this was made easier in 2012 when Doron Behar and colleagues published a new approach to reporting mtDNA results that uses mtEve as a starting point and reports the mutations that occur as we fast forward down through the millennia to the present. Although 16,569 locations seem to be a large number, they do not provide the nuanced distinctions offered by the more than fifty million locations of our other celibate DNA -- our yDNA. Until recently most males were limited to looking at the number of Short Tandem Repeats (STRs) located at 111 distinct locations along our yDNA. Now it is possible to look for Single Nucleotide Polymorphisms (SNPs) along more that ten million locations with the BIG Y test. Other tests on the market now offer to test even more locations -- perhaps half again as many. These NextGen tests offer the possibility of tracing our ancestors' paths down from prehistory into genealogical times -- the era for which we can hope to find written records about our ancestors. I will discuss some of my early experiences with BIG Y test results in Part 2 of this discussion and how you can begin to investigate your own results if you have taken the test. That was a pretty extensive work. Hope you've gotten all those information at your grasp, and have preserved them promptly. Good scanners can be a more than welcome help with that, if I may say so. Anyway, thanks for sharing that! All the best to you!